Lisa M. Pohlman, DVM, MS, DACVP, is an associate professor at Kansas State University. She earned her DVM from University of Guelph and, after 3 years in small animal practice, completed a residency and earned her master’s degree in clinical pathology from Auburn University. Dr. Pohlman is an active teacher and mentor of veterinary students, interns, residents, and graduate students and enjoys providing CE in clinical pathology through speaking engagements, online courses, and publications. She also serves as the medical director of the Riley County Humane Society in Manhattan, Kansas. Numeric and morphologic evaluation of WBCs are essential components of the CBC. Automated in-house hematology analyzers can aid in the numeric portion of the assessment, but no hematology analyzers are able to identify morphologic abnormalities in the cells. 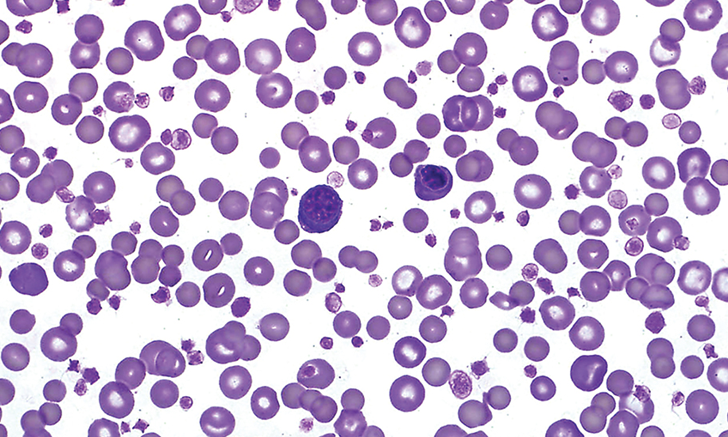 Toxic changes, left shifts (regenerative or degenerative), neoplastic cells in circulation, parasites, and inclusions are among the important findings that require blood film evaluation. 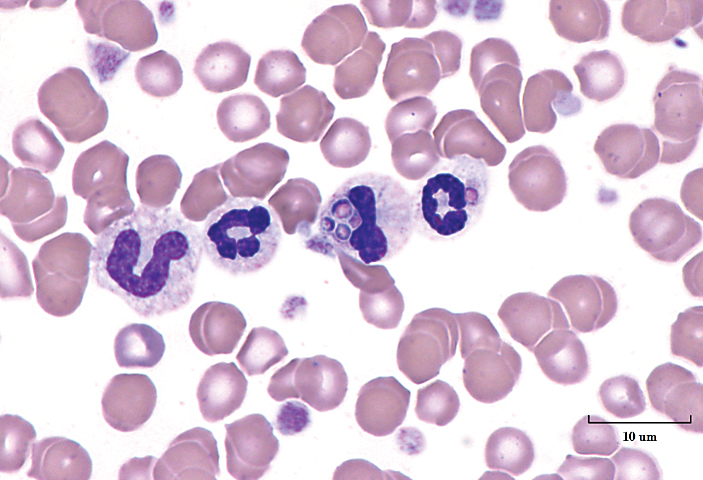 In addition, even when all CBC values are within the reference interval, abnormalities may still be detected on the blood film. The following images and their interpretations focus on WBC morphology. Which answer best matches this image? The 2 nucleated cells seen in this image are nucleated RBCs (nRBCs)—more specifically, an early (ie, basophilic) rubricyte (red arrowhead; inset 1) and a metarubricyte (black arrowhead; inset 2). In routine blood film examination, differentiating between metarubricytes and rubricytes is not as important as identifying these cells as nRBCs. The ability to identify nRBCs is essential because automated hematology analyzers count nRBCs as WBCs, which falsely increases—potentially significantly—the total WBC concentration. In the author’s experience, lymphocytes are the cells most commonly confused with nRBCs by individuals who evaluate blood films without advanced training in clinical pathology. The inset images compare a lymphocyte (inset 3) with the nRBCs. A left shift is the hallmark sign of an acute inflammatory leukogram. 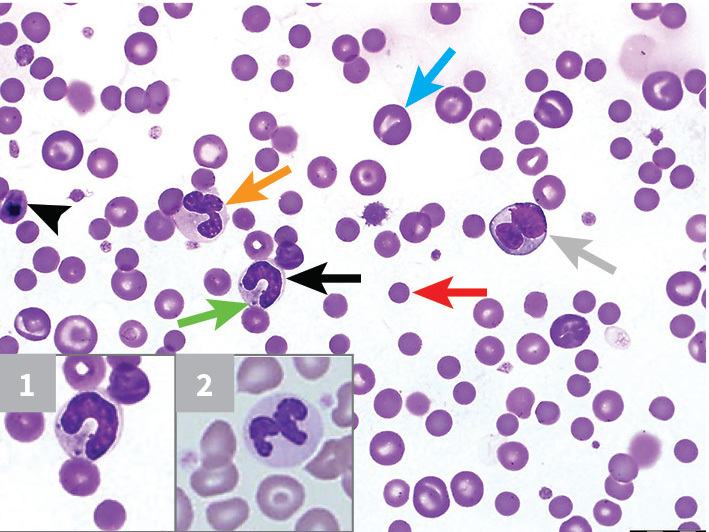 In healthy dogs and cats, rare to no band neutrophils should be observed.1 Although only one band neutrophil (black arrow) is present in this image, if this view is representative of other fields, the bands are significantly increased. 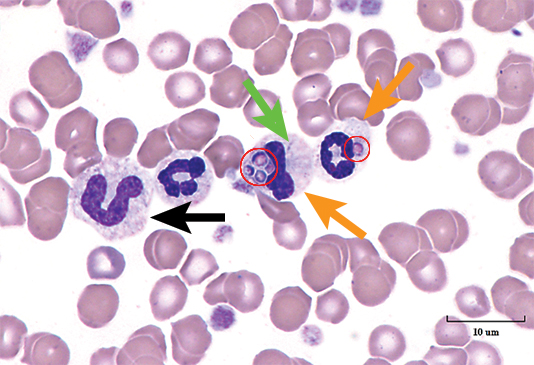 Another notable finding is the toxic change as represented by the Döhle bodies (green arrow) and increased cytoplasmic basophilia; this toxic change can be visualized in the band neutrophil in inset 1 and compared with a normal segmented neutrophil in inset 2. 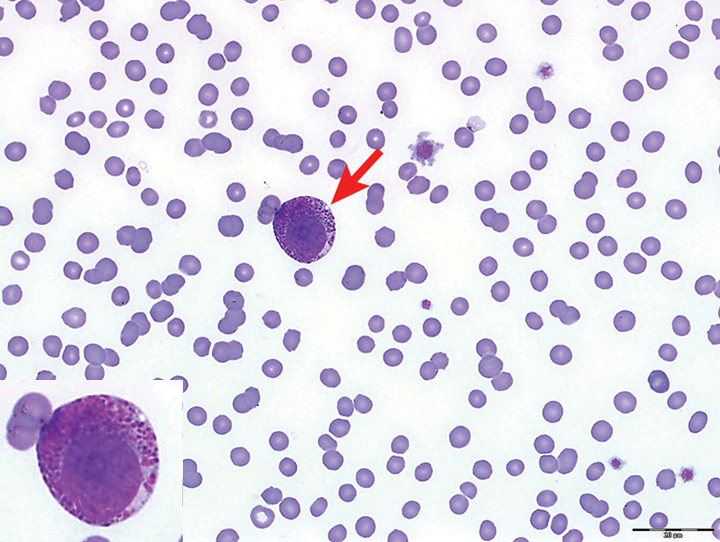 Other nucleated cells include a monocyte (gray arrow), a segmented neutrophil (gold arrow), and a metarubricyte (arrowhead). Within the RBC population, anisocytosis (ie, variation in cell size), polychromatophils (ie, immature RBCS; one indicated by a blue arrow), and spherocytes (one indicated by a red arrow) are visible. 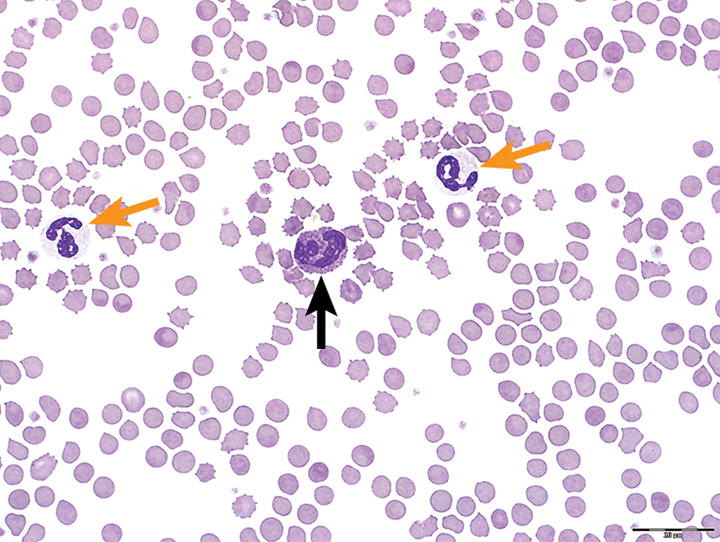 Basophils (black arrow) are slightly bigger than segmented neutrophils (gold arrows). 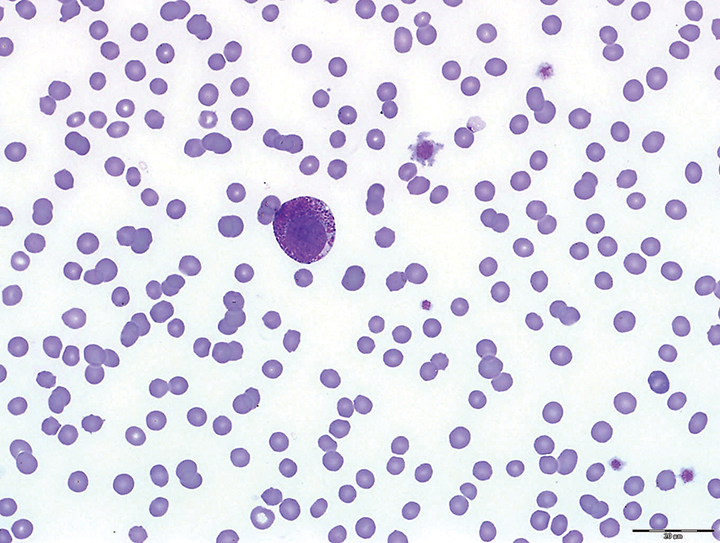 In most species, basophil granules are dark purple, but in cats, granules stain a light lavender or gray color2 and tend to fill the cytoplasm, resulting in a cobble- or pavement-stone–like appearance.1 The nucleus is lobulated (similar to that of a neutrophil) and not round (like a mast cell). 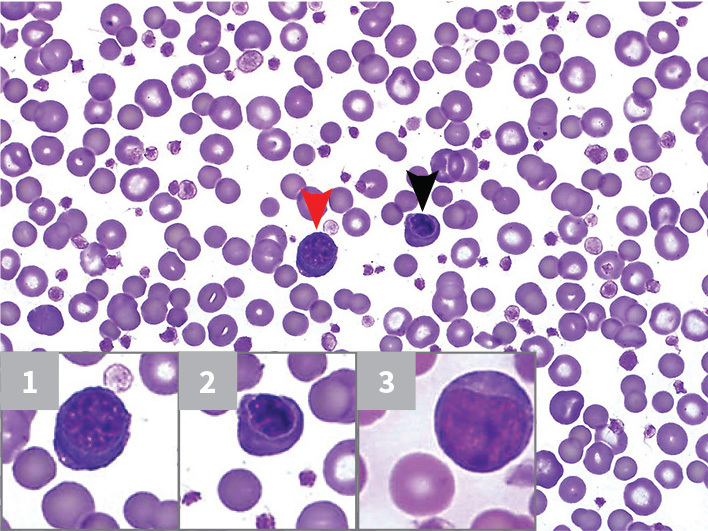 The inset photos compare a feline eosinophil (inset 1; contains pink, rod-shaped granules), basophil (inset 2), and mast cell (inset 3). Identification of one mast cell (red arrow) in the blood is considered sufficient for a diagnosis of mastocytemia. 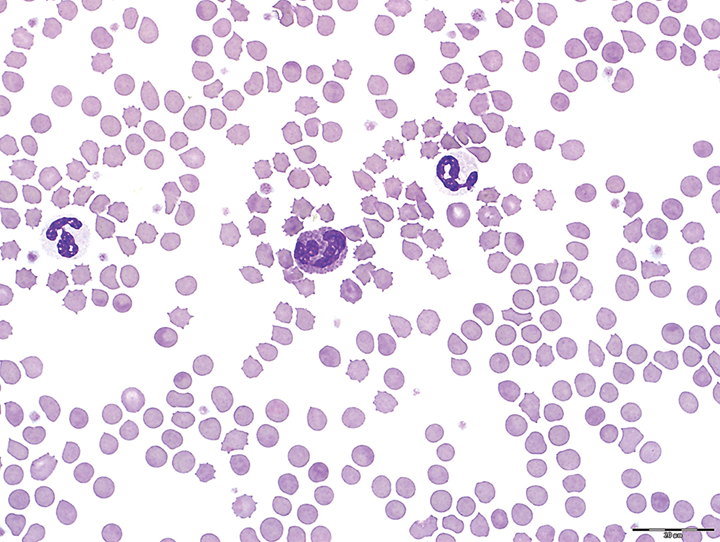 In dogs, mastocytemia is frequently seen with both inflammatory and neoplastic disease.4 In cats, however, mastocytemia is most commonly seen with mast cell neoplasia, although other conditions—including lymphoma and hemangiosarcoma—cannot be ruled out, especially if the concentration of circulating mast cells is low.5 Cats with mastocytemia should undergo a complete diagnostic investigation, including a thorough physical examination and imaging (eg, radiography of the thorax and abdomen, ultrasonography of the abdomen), to identify the cause. Cytology should be performed for evaluation of effusions, visceral and cutaneous masses, enlarged lymph nodes, the liver, and the spleen. 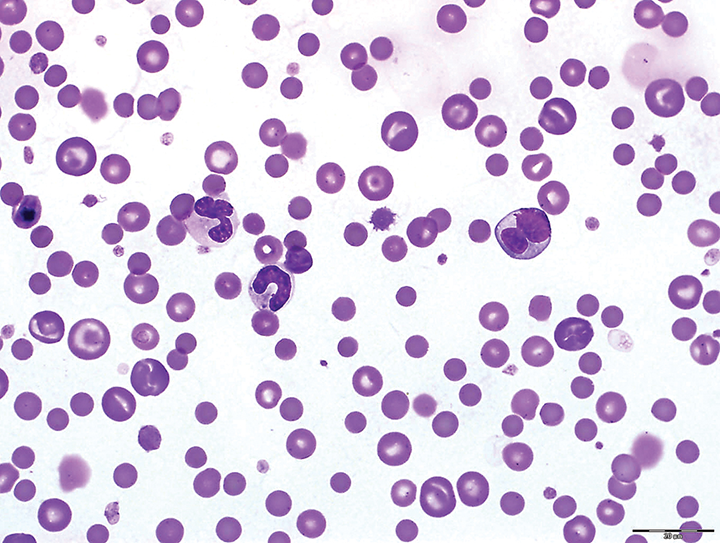 Bone marrow examination may also be helpful.6 The variably sized, round, deep purple granules and the round nucleus can be seen more clearly in the inset. 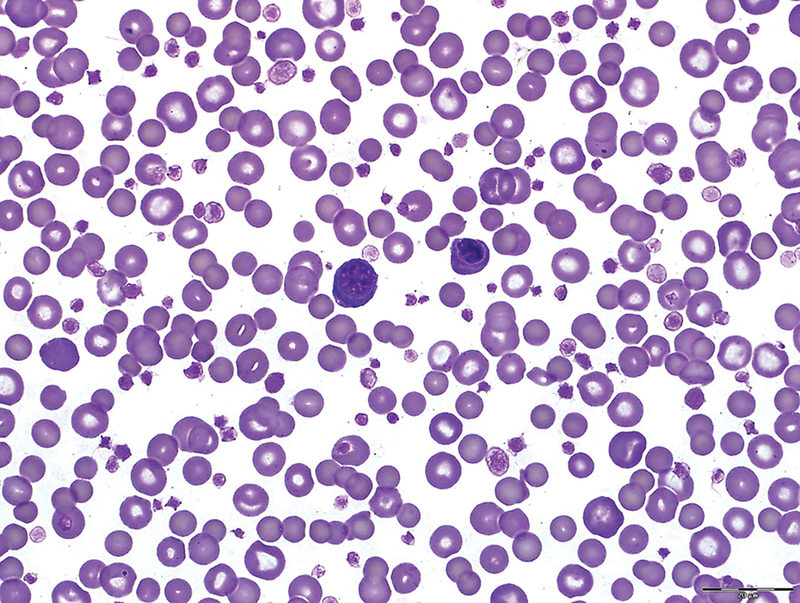 Weiser G. Introduction to leukocytes and the leukogram. In: Thrall MA, Weiser G, Alison R, Campbell T, eds. Veterinary Hematology and Clinical Chemistry. 2nd ed. Ames, IA: Wiley-Blackwell; 2012:118-122. Walker D. Peripheral blood smears. In: Cowell RL, Tylet DT, Meinkoth JH, DeNicola DB, eds. Diagnostic Cytology and Hematology of the Dog and Cat. 3rd ed. St. Louis, MO: Mosby Elsevier; 2008:395-397. Cowell RL, Tylet DT, Meinkoth JH, DeNicola DB. Selected infectious agents. In: Cowell RL, Tylet DT, Meinkoth JH, DeNicola DB, eds. Diagnostic Cytology and Hematology of the Dog and Cat. 3rd ed. St. Louis, MO: Mosby Elsevier; 2008:53-56. Pohlman LM. Basophils, mast cells and their disorders. In: Weiss DJ, Wardrop KJ, eds. Schalm’s Veterinary Hematology. 6th ed. Ames, IA: Wiley-Blackwell; 2010:290-297. Piviani M, Walton RM, Patel RT. Significance of mastocytemia in cats. Vet Clin Pathol. 2013;42(1):4-10. Saba CF. Mast cell tumors. In: August JR, ed. Consultations in Feline Internal Medicine, vol 6. St. Louis, MO: Saunders Elsevier; 2010:697-702.